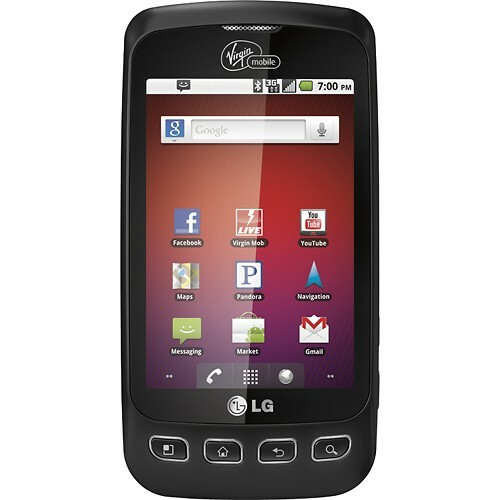 The deal of the week is the Virgin Mobile LG Optimus V Android Phone on sale this week at Best Buy for $79.99. The regular price is 129.99. The Optimus V is one of the best entry-level Android phones available and it works with Virgin's $35/month unlimited data and Messaging and 300 minutes plan, one of the least expensive unlimited smartphone data plans available. Virgin Mobile LG Optimus V Android Phone $79.99 (reg 129.99). Includes a free $35 Virgin Mobile airtime card if activated on a new line in-store). Cricket free shipping and free activation on all phones (online only) Prices and availability are for Cricket native coverage areas. Prices are higher and not all phones available in Cricket MVNO areas. NET10 (online only) Free shipping on all phones $19.99 and above. Free overnight shipping on all Android phones. Free accessory kit (case, car charger and handsfree headset) with most non-Android phones. Free LG 300G bar, Samsung T201G flip phone or Samsung T401G slider with purchase of a $25 refill card. Free accessory kit (case, car charger and handsfree headset) with these phones. Use coupon code DBLUPCARD to get double airtime with purchase of any phone and a $10, $20 or $30 refill. Get $50 in free airtime when you buy the: Refurbished Pink Samsung Intercept M910 Android phone for $79.99 ($199.99 if new) or the $69.99 Sanyo 2700 QWERTY bar phone. Radio Shack Shipping $6.05 unless otherwise indicated. Free shipping on orders over $50. Free Ship to Store. Click one of the links below to get free shipping and a $5-20 discount on all phone purchases. Good through 3/31/12. Straight Talk (online only) Has refurbished phones for as little as $10. Free overnight shipping on Android phones. Free ground shipping on other phones. Free LG220C , LG 420G or Motorola W418G flip phone with purchase of a $30 All You Need refill. Free reconditioned Samsung T301G double minutes for life slider with purchase of a $19.99 60 Minute card. LG 500G double minutes for life QWERTY candybar with free case, car charger and handsfree headset $19.99 (reg $29.99). Free case, car charger and handsfree headset with $14.99 Samsung T155G flip phone, $19.99 DMFL Samsung T301G or $49.99 TMFL LG 800G touch screen. Virgin Mobile (online only) free shipping on all phones. 0 comments to "Prepaid Phones On Sale This Week Mar 18 - Mar 24"